Go and ask a group of college kids what they want to do with their lives. Some will say stuff like… “I want to get a degree” or “I plan on getting this internship and working for this company” or “I want to make money and have a family” etc. However, you’ll find at least one person in the group who says “I just want to be happy” and shortly after everyone in the group will agree. I am a happy person. I like to see others smile and be happy too. Unfortunately, (or fortunately depending on how you look at it) I am not naïve. I know it’s impossible to be happy all the time. Feeling sad, worried, angry, or any other emotion is something I’ve concluded is completely normal and expected in life. I’m writing this blog post because January and February were rough months for me. I was in a funk. I’m not sure whether it was caused by my battle with non-existent anemia/mono/headaches, or cold Colorado weather, or being an extremely out-of-shape college athlete trying to get in shape, or trying to ski double blacks with legs that just didn’t want to go, or getting screwed over by a popular girl whose Rolex is worth more than my worldly possessions and had no business dating a nice guy like me in the first place, or working 15+ hours a week with a full college course load, or simply all of the above. I stopped writing as much on this site, I started blowing off my friends when they needed me, and I received the worst grade I had ever gotten in my college career. Towards the end of February, I realized that I needed to find the source of my funk and snap out of it. So, why was I happy on the AT? Was it the beard growing? The nature? The amazing people? Yes, all of these contributed to my happiness, but one thing stands out to me in particular: the lack of stress. After this realization, I decided that I needed to remove unnecessary stress from my life to feel well and be happy. So, I quit the track team, I got over the girl, I work less hours, it got warmer outside, and blood tests revealed I wasn’t sick at all. Now I am (trying to) be available for my friends, write more material for this website, play more guitar, and do all of the other things that make me happy. In non-trail life it can be easy to get overly stressed out about anything. All of the sob stories I mentioned above caused me to become insanely stressed, the most stressed I had ever been in my life. 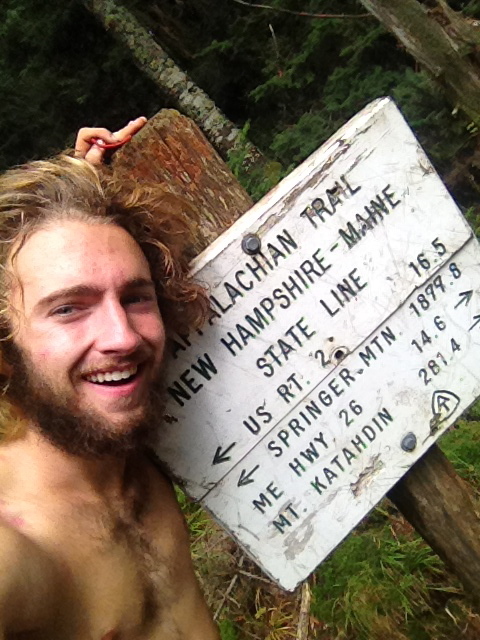 Ever since I removed this stress, I have felt like my normal self, the self that I found during my thru-hike. The self who loves others, lives simply, and (tries to) radiate peace and happiness at all times. The past two months taught me an important lesson: Never let go of what you learned on your thru-hike. For those of you reading this who have completed one, remember to hold the lessons you learned close to your heart. For those of you about to embark on your journey, embrace ever second you spend on the trail. There will be bad times and there will be good times. Soak it all in and grow as much as possible. I just want to be am happy.